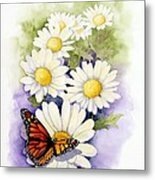 Springtime Daisies by Brett Winn - 6.875" x 10.000"
Springtime Daisies framed print by Brett Winn. Bring your print to life with hundreds of different frame and mat combinations. Our framed prints are assembled, packaged, and shipped by our expert framing staff and delivered "ready to hang" with pre-attached hanging wire, mounting hooks, and nails. Great piece, congratulations on selling. Very nice composition, Brett. Keep up the great work. This is gorgeous Brett, Congrats on your sale!! Thank you Ken. This was a larger than normal piece for me. I really enjoyed getting out of my comfort zone a bit. Fantastic work Brett! I love the composition! Springtime Daisies is my way of saying goodbye to Winter and welcoming the warmth of Spring. I hope you enjoy it as much as I did painting it. 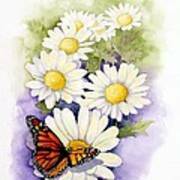 Please share Springtime Daisies with your friends and family.